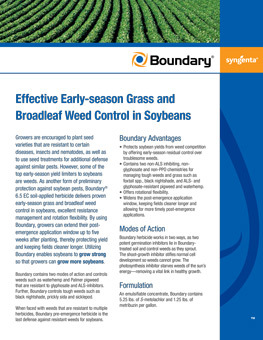 Boundary® 6.5 EC herbicide delivers proven early-season grass and broadleaf weed management in soybeans and potatoes, excellent resistance management and rotation flexibility. Boundary 6.5 EC contains 2 sites of action against weeds, such as waterhemp and Palmer amaranth, that are resistant to glyphosate and ALS-inhibitors. In soybeans, Boundary 6.5 EC applied pre-emergence fits under any trait platform and can be followed by approved dicamba products, glufosinate or Flexstar® GT 3.5 herbicide. Flexstar GT 3.5 is formulated to combat weeds that are difficult to control with glyphosate alone or are resistant to glyphosate and ALS-inhibitors. Boundary 6.5 EC can also be followed by Prefix® residual herbicide in soybeans. Boundary 6.5 EC is one of several Syngenta herbicide tank-mix options available for inclusion with XtendiMax® with VaporGrip® Technology, Engenia® herbicide and FeXapan™ herbicide Plus VaporGrip Technology. Tank mixing with dicamba provides you with additional weed management options and resistance management benefits. Please visit the XtendiMax application requirements, Engenia tank mix and FeXapan tank mix pages for approved drift reduction agents. A full-season herbicide program can prevent weeds from taking root and competing with soybeans for water, nutrients and sunlight. These images show untreated soybeans (left) compared to a program of Boundary® 6.5 EC followed by dicamba post-emergence. Source: Syngenta, 2016; Oregon, MO. Using a full-season approach to weed management is key to ensure rows start and stay clean throughout the season. On the left, soybeans were treated with a post-emergence only herbicide application. The soybeans on the right were treated with Boundary® followed by Flexstar® GT 3.5. Source: Syngenta trials, 2017; Ina, IL. The residual control of Boundary® herbicide is easy to see in these clean rows 3 weeks after application. Source: Syngenta, 2017; Cotton Plant, AR. This image series shows the superior weed management provided by Boundary® followed by Prefix® (right) vs. untreated (left) and Fierce® (center). Source: Syngenta, 2016. The benefits of using a pre-emergence residual followed by a post-emergence product are clear in these rows surrounded by untreated soybeans. 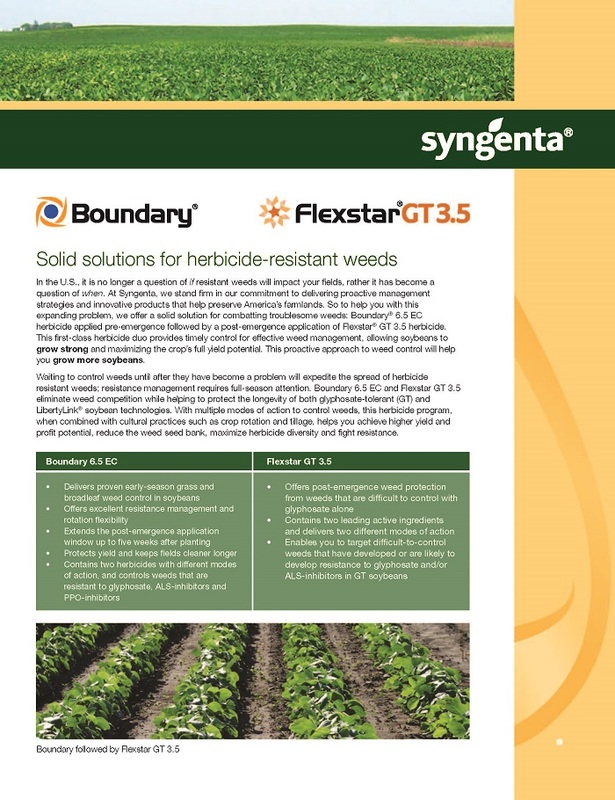 Although the weeds are fighting to spread, Boundary® followed by Flexstar® GT 3.5 is able to hold them back. 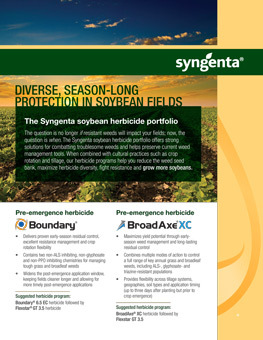 Source: Syngenta, 2015; MS.
©2019 Syngenta. Important: Always read and follow label instructions. Some products may not be registered for sale or use in all states or counties. Please check with your local extension service to ensure registration status. Boundary®, Flexstar®, Prefix® and the Syngenta logo are registered trademarks of a Syngenta Group Company. Third party trademarks are the property of their respective owners.